The NTCA Situation Supplementary Appeal is available in English and in Spanish. This supplementary appeal is presented as a follow-up of the Protection and Solutions Strategy for the Northern Triangle of Central America (NTCA) launched in December 2015. 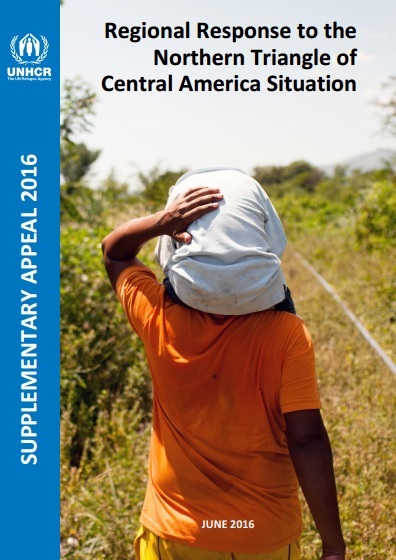 It outlines UNHCR’s protection and solutions interventions planned for 2016 to respond to additional and most urgent needs of refugees, asylum-seekers, returnees and internally displaced people from the NTCA in countries of origin, transit and asylum, encompassing Belize, Costa Rica, El Salvador, Guatemala, Honduras, Mexico, Nicaragua, and Panama. In recent years, NTCA countries – El Salvador, Guatemala and Honduras – have seen a dramatic escalation in violence by organized criminal groups. Current homicide rates are among the highest ever recorded in the region and are as deadly as many contemporary armed conflicts. Sexual violence is also prevalent, with the overwhelming majority of victims being girls between the ages of 10 and 19 years. Disappearances, forced recruitment into gangs, and the sexual exploitation of girls and women also form part of the pattern of violence. The extraordinary epidemic of violence is compelling a diverse range of people to flee their homes and to seek international protection, particularly in bordering and nearby countries. In 2015, asylum applications from NTCA citizens reached 54,877 in the region, nearly double the number lodged in 2014 (28,752), while the number of recognized refugees reached 31,219 – a 41 per cent increase over 2014. The majority of the NTCA refugee population is in the United States of America, with a significant and increasing presence in Belize, Costa Rica and Mexico, as well as to a lesser but still significant extent in Nicaragua and Panama. Among those fleeing are growing numbers of women and girls and unaccompanied and separated children who are particularly vulnerable to sexual assault, human trafficking and other protection risks during displacement. The capacity of certain gangs and organized criminal groups in the NTCA to act transnationally generates a risk of continuing persecution for NTCA asylum-seekers and refugees. Protection risks are also high for certain refugees profiles, such as lesbian, gay, bisexual, transgender and intersex (LGBTI) people, among others. In 2015, more than 230,000 NTCA citizens were apprehended by authorities and returned1 to their countries of origin, reportedly mainly from the United States and Mexico. This number has been in constant upward trend in the last five years, progressively resulting in a two-fold increase compared to the 2011 baseline. Many returnees who fled violence fear returning to their neighbourhoods and become internally displaced. Some returnees have been identified by gangs near reception centres and elsewhere in countries of origin, and have been killed shortly after return. Forced internal displacement due to the violence in the NTCA also appears widespread, although data is fragmented. In Honduras, in just 20 out of some 300 municipalities, the Government identified 174,000 people displaced due to violence between 2004 and 2014, representing some 4 per cent of the population. Most internally displaced people (IDPs) are almost invisible victims of the violence, lone individuals and families who leave their communities discreetly and keep a low profile to avoid drawing the attention of their persecutors. The widespread protection risks for asylum-seekers, refugees, returnees and IDPs require an urgent, strategic and regional response in close coordination with all relevant stakeholders, and UNHCR appeals to its donors for urgent financial support to meet the needs of up to 570,000 people of concern.